Perfect for a large number of guests to self serve cold beverages for a hot summer day while the kids enjoy a bounce house rental! 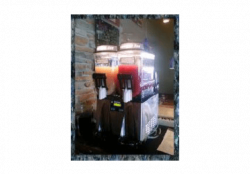 Our slushy machine is cleaned and sanitized between each use. Bruno’s Margarita Machine is a BIG hit with the adult! Rent yours today and get your party the kick it needs.